The HMS Apollyon is a ruptured environment, while the general questions of what seas exactly it sails, and how long its been adrift cannot be adequately answered, it's clear that the space and time it exists in are not normal or natural to it and the majority of life aboard the vessel and has some strange effects. The long noted time dilating effects - decay is both strangely slowed, accelerated and possibly even reversed aboard the ship, at seemingly different rates depending on what happens in a given area - are coupled with a a susceptibility to magical influences and a certain animism that infects almost all objects aboard the vessel. Besides the tendency for bodies that are improperly laid to rest to reanimate or leave dangerous necromantic entities behind, and the ease that Outsider entities can force themselves (or be invited) aboard the Apollyon, there is a third category of manifestation - elemental spirits. Elementals are common and varied aboard the Apollyon, and like anything useful, the hulk's inhabitants have made use of them to increase their own powers. The principal known practitioners of elemental magic aboard the Apollyon are the Froglings, both Sterntowers and the uncivilized tribes within the hull. Water and earth shamanism and elemental magic form the basis of traditional frogling culture, and it is likely that much of the knowledge Froglings have of these disciplines predates their time aboard the Apollyon. Yet the Apollyon's highly magical environment, while most often malicious, has enabled contemporary Frogling practitioners to raise the art of elemental magic to unexpectedly high levels. While not all Froglings are accompanied by an elemental familiar, many are, and the rulers of Frogtown are a circle of powerful water and earth shaman, each of whom has formed a symbiotic relationship with a powerful elemental that the shaman constantly seeks to make stronger by feeding them lesser elemental creatures and using totems and sigils to supplement their elemental's natural powers. 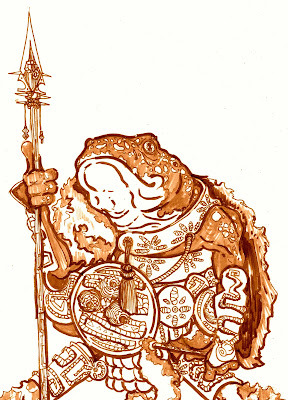 Human magicians, mostly outside the summoning traditions of the passenger caste, have also turned to elementalism on occasions, but most often consort with fire elementals rather than earth and water, perhaps as a way to avoid any appearance of competition with the more powerful frogling practitioners. Below is a brief description of the Elementalist wizard and Frogling class skill set. Wild elementals also abound, though they tend not to be 'pure' elemental forms of the cardinal elements (Earth, Air, Fire & Water), but rather strange para-elementals formed of the unnatural environment of the Apollyon. these creatures are almost always hostile and are hunted by elementalists as feeding on their essence will allow 'pet' elementals to grow in size, power and intelligence. At 1st, 4th, 7th and 10th level arcane magic users may decide to study the discipline of elemental magic (froglings being limited to only three magical disciplines: elementalism, shamanism and vivimancy). Once picked a skill increases in rank (form 1 to a possible 4) whenever a new skill granting level is reached. Thus a 4th level Frogling elementalist, who had decided to supplement her study of earth magic with vivimancy (healing magic) at 4th level would be a rank 2 elementalist and rank 1 vivimancer. Elementalism's principal focus is the caster's symbiosis with an elemental creature. This relationship grows as the level of the caster progresses, as the caster's ability to control and regulate his allies' power increases and allows the elemental to grow in size, ability, prowess and intelligence at each rank. An elementalist must first pick which of the four cardinal elements they will ally themselves with: Earth, Fire, Water or Air, and this relationship cannot be changed once selected. If a familiar is killed the caster immediately suffers D6 x 1/2 familiars HP in damage, as the symbiotic link is broken. Additionally a new familiar may not be summoned for a year and a day, the elementalist gains a level, or the elementalist makes a special sacrifice/performs a special duty on behalf of her chosen elemental ally. New Allies will appear at the lowest HD of the class of elemental ally they are (i.e. 1, 4, 7 or 10 HD). In addition the elementalist gains a -1 to all damage taken associated with his or her chosen element. RANK 2 - Elemental Protector. The elementalist is able to strengthen his elemental ally to the point where it becomes almost human in intelligence with combat skill equal to that of a trained warrior. At this point the elemental will begin to appear bipedal, and vaguely humanoid - often as a crude double of the caster. Though intelligent, these elementals are still awkward in the material world, and this awkwardness manifests itself as a a lack of self direction. FIRE: May cast Light 3x per day (including blinding attacks) and Affect Normal Fires 2x per day. Immune to all fire based attacks, take 1/2 damage from earth based attacks of a magical nature. WATER:May cure light wounds 1x per day, purify water at will. Immune to all ice or water based attacks and 1/2 damage from earth based attacks, including a -1 damage resistance to normal weapons. AIR: Effective Stealth of 3, may make a "backstab" attack from stealth. Immune to all air and electrical based attacks 1/2 damage from water and ice based attacks. FIRE: The elemental is protected by its flames, making attacking it in melee a poor choice. Any creature striking the fire Elemental in melee combat suffers immediate damage equal to the elemental's attack. Attackers may make a Save vs. Spells for 1/2 damage.Additionally Rank 3 fire elementals are immune to non-magical attacks or weapons. WATER: The elemental may subsume 1 human sized target within itself on a successful grappling attack (Elemental is presumed to have a STR of 12 + 1/2 HD for this purpose) trapping that target within its body, and drowning them at the normal rate if possible. Additionally Rank 3 water elementals are immune to non-magical attacks or weapons. It is said that some frogling shaman will use this ability, and their ability to hold their breath for long periods of time, to wear their water elemental ally as a suit of armor. EARTH: Elemental is enormously strong (STR 15 + 1/2 HD) (gaining bonuses to melee hit and damage). Using it's control of the earth, elementals of this size may slow opponents as the spell up to X3 per day. Additionally Rank 3 earth elementals are immune to non-magical attacks or weapons. FIRE: the most powerful Fire Elementals may spit flame as a ranged attack up to 60' away for their normal damage. Fire Elementals of this level may also create a Wall of Fire (as the spell) once per day. WATER: Water Elementals can kill opponents with a touch when they become this powerful. Each elemental will have its over method: instantly desiccating the target, surging into a creature's bloodstream and tearing loose, or poisoning the target with toxins within it's own body. Whatever the method, the effect is the same. An elemental's first attack on a target will be lethal should that target fail to save vs. poison. EARTH:Powerful Earth elementals have developed a bond with their elementalist that allows the partnership to form a single symbiotic entity. The caster is encysted within the elemental, protected by it's AC and hit points, while still able to cast from within. The elemental may also attack while it carries the elementalist. Additionally an elemental of this level of power is the equivalent of magic armor, causing a -1 to opponents chances to hit. AIR:Air elementals of this size gain the ability to kill targets as an assassin of great skill by rupturing the lungs of any humanoid target they can ambush on a successful backstab attack. Additionally powerful air elementals are so insubstantial that the may flow through any gap at least 1" in diameter. On a day to day basis an elemental requires on a small portion of its related cardinal element in an inert form to sustain itself (Earth elementals devour rock or metal, Water elementals bathe themselves in liquid etc. ), but in order to grow in power an elemental must devour the essence of another elemental of greater power (Hit Dice), after that entity has been destroyed or dispersed. The Elementalist must be present to channel the defeated elemental's power into his ally, and this is the core of the symbiosis between elementalist and elemental. Upon devouring another elemental's essence the elemental may take on some characteristics of the eaten opponent. A water elemental that devours a larger air elemental may become something akin to a steam or mist elemental, while one that dines on an earth elemental will come to resemble ooze, oil or even plant. As a mechanical effect, an elementalist my increase the hit dice (and abilities) of his familiar or ally by feeding it another elemental. The elemental will be limited by the lower of either the elementalist's level/Hit Dice or the Hit Dice of the creature devoured. Smoke- Ghostly figures filed with noxious smoke or fumes, and capable of choking mortal targets or poisoning them with the substance of their being. Voltaic - Electrical beings made of lightning, voltaic elementals are rare below decks, but often extremely powerful. Abyss - Strange and powerful elementals formed from the highly compressed waters of the deep sea. Considerably denser and stronger than normal water elementals, any creature captured within them will be crushed by the terrible pressure that their waters contain. Weed - Elementals that have taken in enough earth essence to spawn life within themselves and are full of algae and weeds. The plant life perhaps links these creatures more closely to the material plane, but as a practical matter it allows them to choke and entangle in addition to the normal pummeling and drowning attacks of a water elemental. Blood - Elementals made from the blood of living things are most often evil and hungry predators, seeking to drain the blood of mortals to increase their own size. Terrifyingly these creatures may force themselves into the bloodstream of a target and cause them to explode moments later in a welter of gore. Slime - Earth Elementals that have dined too much on water elemental essence, slime elementals are able to flow and shift like water, even absorbing their targets, but strike with the ferocity of an Earth Elemental. Iron - Appearing almost as statutes, Iron Elementals are stronger and more resistant to damage than even Earth Elementals. Rust - An Earth elemental primarily concerned with decay, rust elementals are colossi of flaking oxidized metal slowly returning to dirt, they are fairly common aboard the Apollyon and have the ability to corrode metal. Ash - Fire Elementals that have "burned out" because of exposure to too much earth or water elemental essence, Ash elementals are forlorn creatures that drift and crawl with great stealth, only to flare into sudden flame, ambushing their victims. Ember - Burning down in the dark, Ember elementals constantly seek flammable material to impregnate and transform into smaller flame elementals. Forge - A forge elemental appears as a being of glowing molten metal, and in addition to the solidity and strength of a Earth Elemental their red hot bodies cause instant combustion. The most powerful forge elementals can also heat and shape metal at will from a distance. A Table for Wermspittle - "Those aren't worms!" Tomb of the Rocketmen - Overland Map. Tomb of the Rocketmen - Locale Ideas.